A couple Wednesdays ago I needed to make a run to Home Depot to pick up some plywood and hardware for some small renovations I am doing in my loft. The same evening I was planning to meet my brother at his house and carpool with him to play ice hockey with his work mates. It just so happened that my brother lives near Home Depot, so I could do my Home Depot run and play hockey the same night. 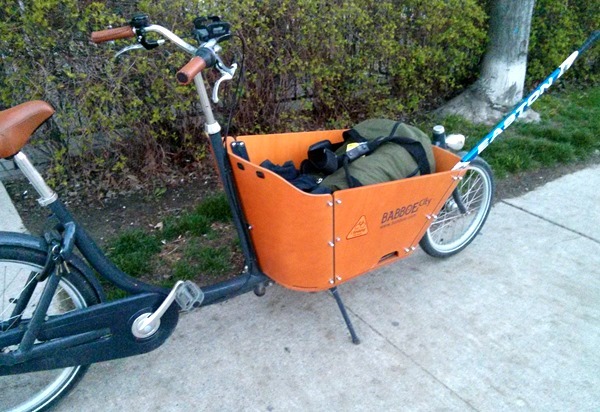 So I loaded up my Babboe cargo bike with my hockey gear and pedaled 9 kilometres to the Home Depot on the east side of the city. 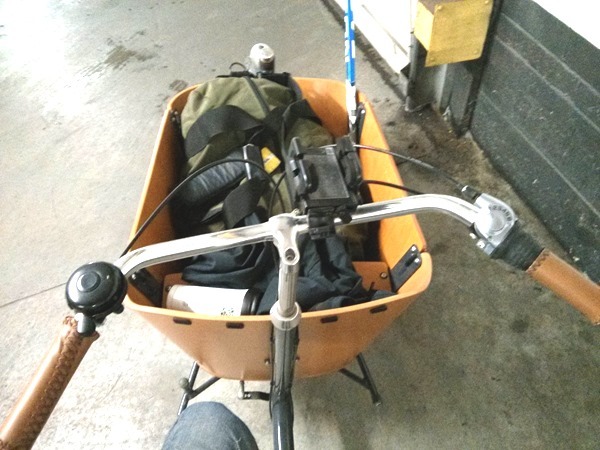 I wasn’t entirely sure at first whether the cargo bike would adequately carry the amount of lumber I was going to purchase, so I kept open the possibility that I may need to return the next day with a motor vehicle. 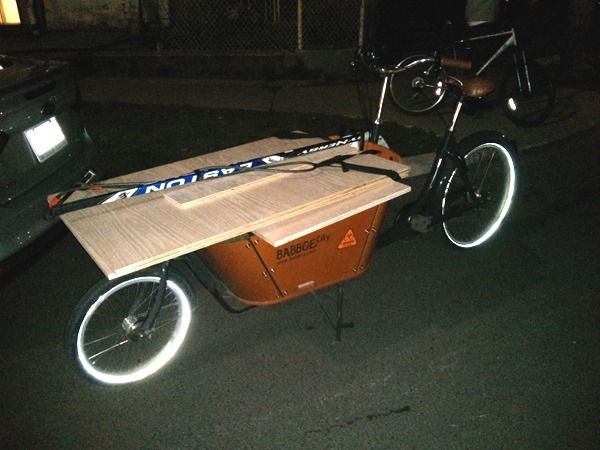 As it turned out, my cargo bike proved sufficiently capable of handling a heavy load of plywood (oak no less) in addition to all of my ice hockey gear. Hell, I probably could have thrown a 24-pack or two of beer on top of everything without issue. I hadn’t brought any rope with me, so I used my cable bike lock to hold the wood together to avoid shifting as we hit bumps along the way. The ride was surprisingly smooth, and the weight of the load making bumps in the road hardly noticeable. It was a beautiful spring evening, so my brother accompanied me on my ride home after midnight that night and we took a 13km scenic detour along the waterfront, breathing in the fresh spring air. Sure, I could have taken a car, but I wouldn’t have been able to slip past busy traffic early in the evening on the way there. Nor would I have gained any exercise, or had the opportunity to clear my mind and enjoy the fresh air while riding along the waterfront path on the way home. Yet another pragmatic use for the trusty bicycle that goes against what is considered “normal” in our society. I may get strange looks now, but perhaps some day Home Depot will have designated cargo bike parking spots for people who prefer the joy of getting around town by bike over being stressed out behind the wheel, stuck in traffic. I’m fortunate to live only 2km to Home Depot, so bringing things back home usually isn’t an issue. I would love a bike similar to the one you have…or at least break down and finally buy/build a trailer…Having said that I still haven’t run into anything I’ve needed, that I can’t bring home on my bike. Everyone knows that these kinds of errands simply can’t be done with a bicycle. Every right thinking person knows that you need yourself a big, nasty Ram pick up for runs to the Big Box stores. Sure, James- I’d be honored!